Recent data underscores how much difficulty organizations are having in understanding the ‘how to’s’ behind third party compliance management, including the critical questions of how to perform effective due diligence and how to monitor and evaluate compliance once third parties are on-boarded. The ‘how to’ problem is exacerbated with the sheer scope of the problem – the hundreds and thousands of third party relationships that need to be managed on an ongoing basis and the extent of an organization’s exposure based on the complexity and number of country requirements. 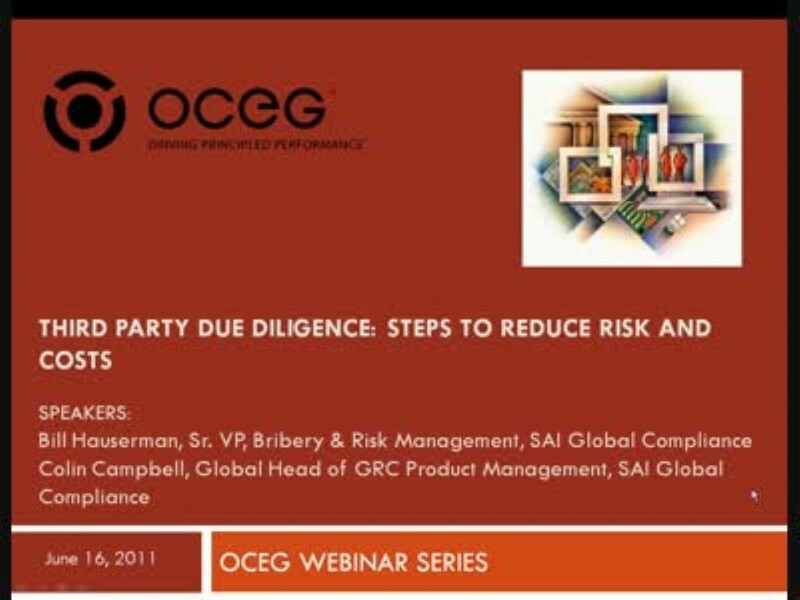 In addition to outlining the key challenges to an effective due diligence business process and the complications that drive those challenges, SAI Global shows the detailed steps to a cost-effective solution that includes a discussion of a well-designed technology platform and workflow that has helped Fortune 100 companies both improve their regulatory compliance and their bottom line business results. We have emailed instructions to access Third Party Due Diligence: Steps to Reduce Risk and Costs to . Make sure the email arrives in your inbox: either add "support@oceg.org" as a safe sender to your email platform, or if you use Gmail, drag our email into your Primary tab.